Used by millions of people every day, Flipboard is a platform for people to navigate and discover the world’s best content. Competing with leading platforms for the attention of its global audience, the brand needed to shape its positioning in a unique and unforgettable way. To do this, it meant developing an understanding of its consumers that went far beyond demographics. Developing a brand identity that stands out from the crowd. As a global platform appealing to consumers on a worldwide scale, creating content that appeals to everyone is a familiar challenge. Shaping a brand message that would resonate across borders meant finding the right elements to focus on. “We need to understand our audience in order to best position ourselves in-market today as well as define new segments to attract as our product evolves,” says Amie Green, Head of B2B Marketing at Flipboard. Who is our audience today and how is it changing? Where are we strongest relative to our peers? How engaged is the Flipboard audience compared to others? These insights would not only serve to shape an effective message, but simultaneously demonstrate the potential of Flipboard’s highly engaged, global audience. For Olivia Buck, Measurement Lead at Flipboard, it’s about proving how well they know their audience, and which brands will resonate most with these users. Uncovering the multifaceted mindset of the Flipboard audience. GlobalWebIndex provides both global and local insight into the psychographic attributes of any given audience. With ready access to this data, the teams could develop a much deeper understanding of their consumers, delving into the motivations, self-perceptions and aspirations that make them unique. “It’s so important to us to be able to appeal to the aspirational nature of our audience”, says Amie. “I rely heavily on insights from GlobalWebIndex to define our audience for the marketplace, and also internally. The psychographic data points in particular ensure we have those extra layers and dimensions on our audience, beyond demographics. Using the platform, the teams could build out an in-depth profile of the multi-layered, multifaceted mindset of the Flipboard consumer. By analyzing the statements that proved most important to these individuals, certain distinct qualities became clear, allowing for deeper thinking around the role Flipboard plays in their lives. “These are people who are trying to achieve more in work and play, and Flipboard is a tool that helps them achieve a lot of these aspirations”, says Amie. Deepening client relationships through detailed profiling. “Having access to this data helps us put a profile to an audience, instead of just a stat”, says Olivia. But these profiles weren’t limited to their core audience of Influential Achievers. With the ability to deep-dive into any audience, it meant deepening client relationships with insight they couldn’t find elsewhere. Offering examples that prove the best return, Olivia explains how this data worked to drive revenue for the brand. “GlobalWebIndex enabled us to illustrate the key characteristics of the Entertainment Enthusiasts on Flipboard to an existing client. ", she says. "The detailed data around media consumption habits and viewing trends opened up opportunities for new budgets where we weren’t in the initial consideration set." “This data also enabled us to secure a partnership with a global business and strategy consulting firm at a 12X increase in budget", says Kevin Strunk, Account Executive. 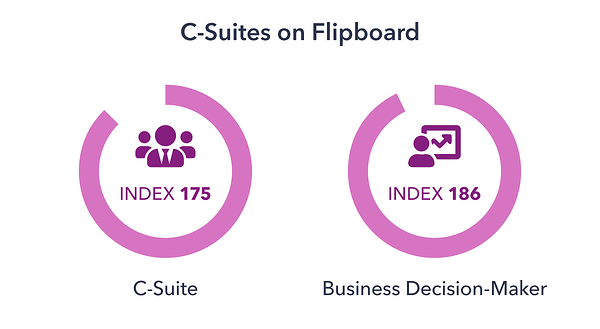 "We did this by quantifying the presence of C-Suite professionals on our platform." Driving revenue with a consumer-centric focus. For the Flipboard team, leading with powerful consumer insight is the key to positioning their brand in the right way. Having seen what they could achieve through the GlobalWebIndex platform, access was rolled out across the business. Featuring dashboards translating in-depth profiles of their core audiences, this helped to develop a deeper audience understanding internally, empowering revenue teams with a single, shared view and definition of who they were targeting. By uncovering who their core audiences were, including what defines and motivates them in life, they knew where to focus their attention, shaping a consumer-centric go-to-market strategy. Using GlobalWebIndex, Olivia explains how they have expanded partnerships and secured new business. “Using insight from the platform, we were able to prove the presence and purchase power of small business owners and decision-makers on Flipboard to a major telecommunications company, expanding its partnership into new lines of business”, she says. Helping the brand develop a strong message that’s driven by data, the teams can think ahead and steer their strategy in the right direction. “This insight also helps to guide our audience development for the future”, says Amie.